Granted I do have a dedicated 2-channel room, for the most part though our newly enlarged living room is the place we spend most of our time. That includes TV and movie watching, with occasional background music. In the middle of this expensive renovation, where the estimates from yours truly were let’s say, in the 50% of the actual cost range, I proposed adding a reference-quality “stealthy” audio system. I had a short window as this was a last-minute decision and walls would be open for a short period of time. My next call (text) for help was to Jack Shafton, GoldenEar Technology’s V.P. of Marketing and Sales and just all-round affable guy. Jack didn’t have to twist my arm to get me to buy into more is better, we opted for a 5.1.4 Dolby Atmos system. That meant, six in-ceiling speakers, two in-wall speakers, a free-standing sub and a table-mounted center channel. I needed another approval. Asked and granted. Arranged for me was the GoldenEar Invisa Series speakers for in-walls and ceilings: For main left/right channels, the Signature Point Source (SPS). A pair of rear/surrounds Invisa HTR 7000. For the height channels, four-Invisa 650. 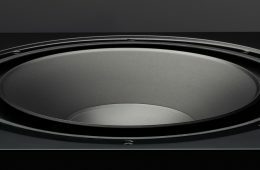 GoldenEar had just released their new SuperCenter Reference for a center channel. Lastly a single, (for now, because a second sub would require additional approval) the SuperSub X. The plan shows the challenges of developing a workable audio solution – large openings on either side of the room, an offset fireplace and 4 windows. I’ll be outlining the decisions I made, why and how I needed to alter my original plan and the results. Hope it can help in your planning for a surround system.